Green Seagull’s Christmas single feels like a journey – a journey back in time, to the late 1960s, and a journey to the inner depths of your mind, as it brings you in a dreamy state, where illusion and reality form a completely new experience. The single, that as all Snowflakes singles comes on snow white vinyl, is as much inspired by winter as by Christmas. 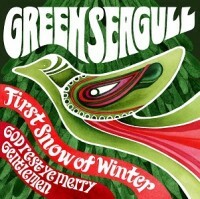 Green Seagull's original, 'First Snow Of Winter' is a baroque pop song about that element of winter that directly brings a feeling of comfort and joy, a feeling of Christmas, in your heart: snow. The lyrics take you on another journey, a journey from the early beginnings of winter to the last snow, when spring is announcing itself and the first flowers start popping up. For the B-side, the band recorded a song that is already part of their live set for some time: an uptempo organ-drenched psychedelic version of the Christmas traditional 'God Rest Ye Merry Gentlemen'. Green Seagull, part of London's burgeoning neo-psych scene, started in 2016, when Paul Nelson (New Electric Ride) and Paul Milne (Hidden Masters, Magnetic Mind), who both share a love for late-60s baroque psychedelia and 12-string jangling guitars, started to write songs together. Soon joined by Sarah Gonputh on keyboards and Elian Dalmasso on drums, the four started rehearsing, taking their name from a mis-heard Rolling Stones lyric. After recording a 4-track demo, the band signed a deal with Mega Dodo Records, and after two well-received singles for the label, Green Seagull released their debut album 'Scarlet Fever' in 2018.